Welcome to the blog for Floating Forests! We’re totally excited to bring you into our kelpy world! What do I mean? Well, we’re a team of scientists (more on that later) who are trying to discover whether the amount of Giant Kelp in the world is changing. And we need *you* to help us. Yes, Giant Kelp! I’m talking about Macrocystis – a HUGE brown alga that can grow over 100 feet (that’s 33m) with its fronds laying across the surface of the ocean. It’s found in close to shore in colder waters – California, Chile, Tasmania, and more. Divers love it. Diving in a mature forest is like being in the Redwoods. All kinds of sea life love it, too, as it grows incredibly fast and sloughs off a lot of material for grazers to munch on every day. 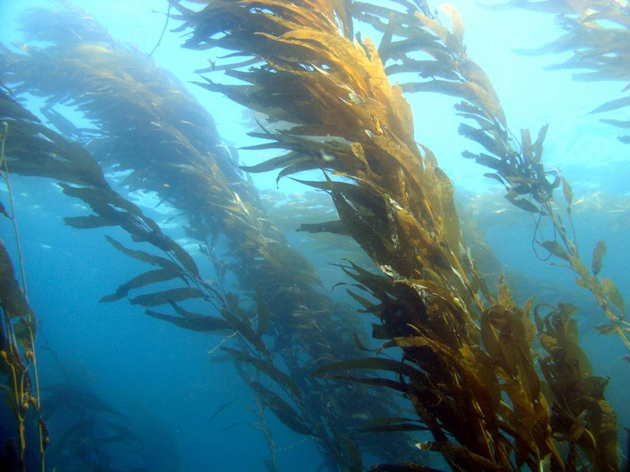 Kelp forests are a huge providers of services and benefits for oceans wherever they occur. So if the amount of kelp and kelp forests in the world was changing, there could be all sorts of consequences for the services our coastal oceans can provide. Why might it be changing? There are a lot of reasons the amount of Giant Kelp in the world might have shrunk or grown over the past few decades: Climate change, coastal urbanization, changes in kelp-munching urchins, to name just a few. But we just don’t know. 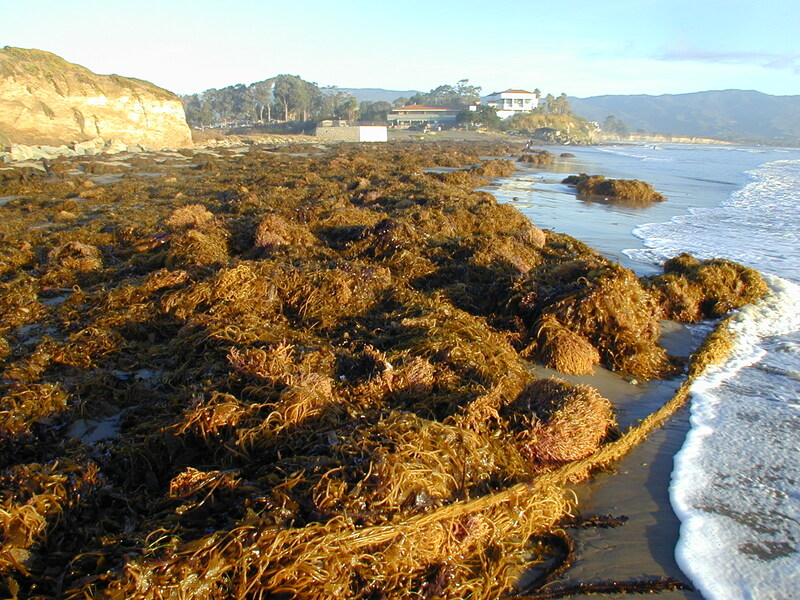 Kelp washed up on a beach after a strong El Niño. Photo courtesy of the SBC LTER. While some awesome research programs have gone out and measured change in kelp over time at a small handfull of places, Giant Kelp is found throughout the world – often in places researchers seldom can get in the water, such as the sub-Antarctic Islands. So, why don’t you know if the amount of Giant Kelp in the world is changing already? Well, scientists have been monitoring Giant Kelp in some places for years. But only a few places where they can get constant good access to dive sites. And even in many of those places, by ‘years’ I mean ten, or twenty. So, something like long-term records of kelp abundances on the sub-Antarctic Islands? Nope. We’ve got nada. Heck, there are even areas in California or Chile where people have been working for decades, but are too difficult to access, so we don’t have any data. But we have a solution. We can see Giant Kelp from space. Kelp! From! Space! We’re very excited. An image from some of Kyle’s early work on using satellites to see kelp in Santa Barbara, CA. I’ll post the origin story for this project next week, but in short, Kyle Cavanaugh, while a PhD student at UC Santa Barbara figured out how to see kelp using the Landsat family of satellites. These images provide global coverage back into the early 1980s! We potentially have over 30 years of data, waiting to be pulled out! Yeah, sure, can’t computers just do this? Nope. Things like clouds, the crests of waves, sun glint, and more can confuse image recognition algorithms. But people. People can get the job done. And so, we want to take you on a tour of the Giant Kelp forests of the world, and have you help us hunt down when and where kelp exists! Fortunately, the good folk at Zooniverse thought this was as cool of a project as we do, and so they built this amazing platform to help us bring the kelp to you! OK, I’m interested. But who is this we you keep talking about? The Science team at the Floating Forests project is a group of researchers who have been working in kelp forests all of their lives. We’re divers, remote sensors, stats monkies, and all around passionate kelp enthusiasts. 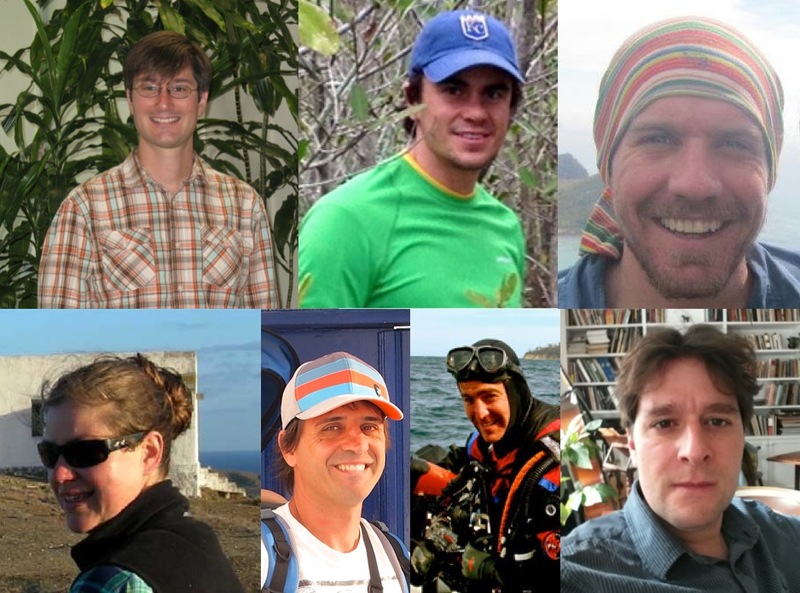 We’re part of the global Kelp Ecosystem Ecology Network – a network of over 60 scientists working in a wide variety of kelp ecosystems. This project represents a dream of ours – to look at a wonderful global dataset, but to bring citizen scientists and folk just interested in looking at how their coastlines have been changing into the process with us. We hope you enjoy, and we’re really excited to tell you more about kelp forests and the amazing science that goes on there as this project moves forward! And thanks again to the amazing team at Zooniverse for making this happen! I’m in! I love kelp forests.